The hopeless task of disciplining two unruly slackers (which is just one of its clever title’s implied meanings) gives substance—and allegorical form—to this flinty first novel by a British writer whose grim humor has been compared to that of Irvine Welsh. 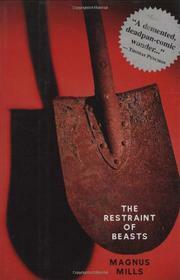 But Mills uses kitchen-sink realism as means rather than end in his curiously fashioned tale of the strange symbiotic relationship binding its narrator—the English foreman of a Scottish company that installs “high-tension fences”—with his obstreperous charges Tam and Richie: skilled laborers who —could only work in the day if they had beer to look forward to at night.” The plot therefore consists of reiterated descriptions of exhausting workdays endured in mostly miserable weather, and compulsive pub-crawling in which the initially reserved narrator becomes an increasingly willing crawl participant. A horrendous accident deftly shifts the story’s stark tone—but when it’s repeated with only minimal variations, the carefully laid naturalistic surface parts, throwing Tam, Richie, and their boss into the region of Kafkaesque nightmare. Later, at a job in England, a further sequence of “accidents” puts them in thrall to Hall Brothers (the local “fencers”), a mysteriously diversified company that gradually discloses its expertise at building livestock pens and —electrified cages” (for less obvious purposes), and eventually to work as arbiters with the task of bringing the alien fencers to judgment. Until its enigmatic closing pages, the novel works nicely as a taut little drama of rebellion against the injunction that “All fences had to be straight” (one thinks of the similar metaphoric action in Alan Sillitoe’s “The Loneliness of the Long-Distance Runner”). But the expansion of the story’s simple contours spells out too much, and blurs its haunting suggestiveness. All the same, a strongly imagined and more than promising first effort.